Shishkin, Ivan Ivanovich (January 13 (25), 1832, Elabuga, Vyatka Province — March 8 (20), 1898, St. Petersburg) — famous Russian landscape painter, master of realistic forest images. Studied with Apollo Mokritskyat the Moscow School of Painting, Sculpture and Architecture, Socrates Vorobyov— at the Imperial Academy of Arts. He was one of the founders and an active participant in the Association of Traveling Exhibitions, paintings by Ivan Ivanovich Shishkin were present at all exhibitions of the Wanderers until the artist’s death. Features of the artist Ivan Shishkin: the accuracy of the picture, even in the smallest detail, the faithfulness and veracity of the image (by the paintings of the artist Shishkin you can study the structure of plants), the epic scope. Shishkin very scrupulously approached the authenticity of the image that he was sometimes blamed for. 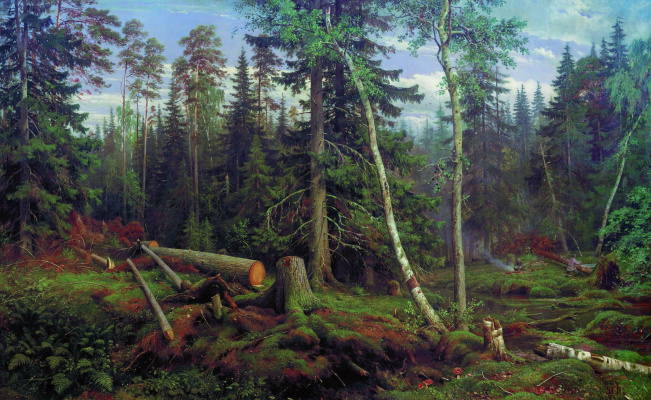 It is believed that the skill Shishkin-colorist inferior to his talent as a draftsman. 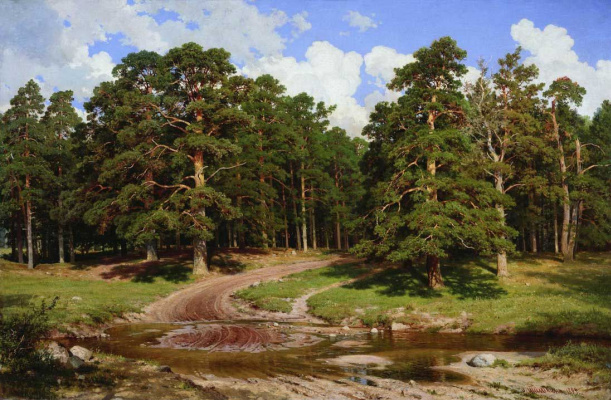 The landscapes of Shishkin are realistic, his attitude to nature is not a romantic delight enthralled by beauty, but a calm and thoughtful study. Famous paintings Shishkin: "Morning in a pine forest", "Rye", "View in the vicinity of Dusseldorf,"View of the island of Valaam. Kukko Terrain, "In the north is wild", "Ship Grove", "Backwoods". When Ivan Shishkin will lose his beloved people, forget inspiration and fall into deep depression, the meaning of life will be returned to him repeatedly by Yelabuga, his native city located in the Vyatka province. For many years his father was a mayor there, wrote "The Story of Elabuga is proud" and, of course, hoped that his son would continue the merchant family business and glorify his native city. With the second, everything turned out: the paintings of Ivan Ivanovich Shishkin sang and the beauty of the small homeland, and the endless forests of the large homeland. The young man was not disposed towards commercial affairs and is not capable of categorically, as well as to any other, except painting. So that no one has any doubts, Ivan Shishkin, having studied for four years at the Kazan gymnasium, left it without permission, declaring to his relatives that he did not want to "become an official". It did not cause delight, especially in the mother. The father, having understood that the boy is firm in his decision and seriously intends to be engaged only in painting, sent him to the Moscow School of Painting and Sculpture. Apollon Mokritsky became the first teacher of Ivan Shishkin. It was he who instilled in the artist Shishkin respect for the drawing and the strict correspondence of the forms of the image in the picture and in reality. The direction of his gift Shishkin realized almost at the beginning of his journey: landscape, landscape and a little more landscape. There was nothing higher than the ability to portray nature for him: "A landscape painter is a true artist, he feels deeper, cleaner (…) Nature is always new and always ready to give an inexhaustible supply of its gifts that we call life. What could be better than nature! ". 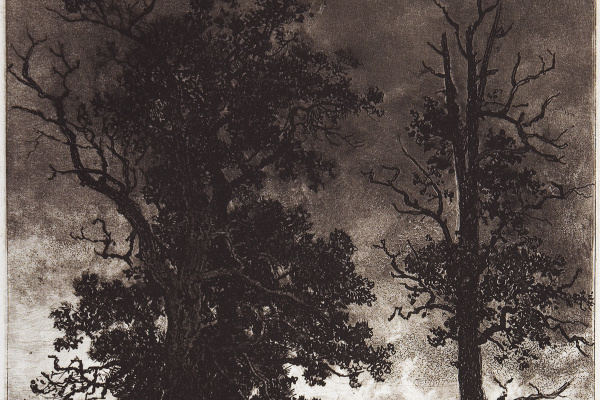 Pictures of the artist Shishkin — a strong enough argument to admit: little can be better. Shishkin for many years kept in touch with his teacher. Even learning from Socrates Vorobiev at the Academy of Fine Arts, which was the logical next step after the Moscow School of Painting, Sculpture and Architecture, he often turned to the first tutor. And Mokritsky was sad about parting with a student, whose talent was well felt, but predicted that soon everyone would learn about the paintings of the artist Shishkin, "If he will be engaged in the Academy with the same love". Shishkin’s first impression of Petersburg was by no means enthusiastic: "Cold prudish city, here I recalled Elabuga with sadness". But his house will henceforth be in this cold city. At the Academy, Shishkin studied, probably, with all the same love that had struck his first teacher. At least, this is evidenced by the success of Ivan Ivanovich Shishkin during his studies and the medals with which his paintings were awarded. 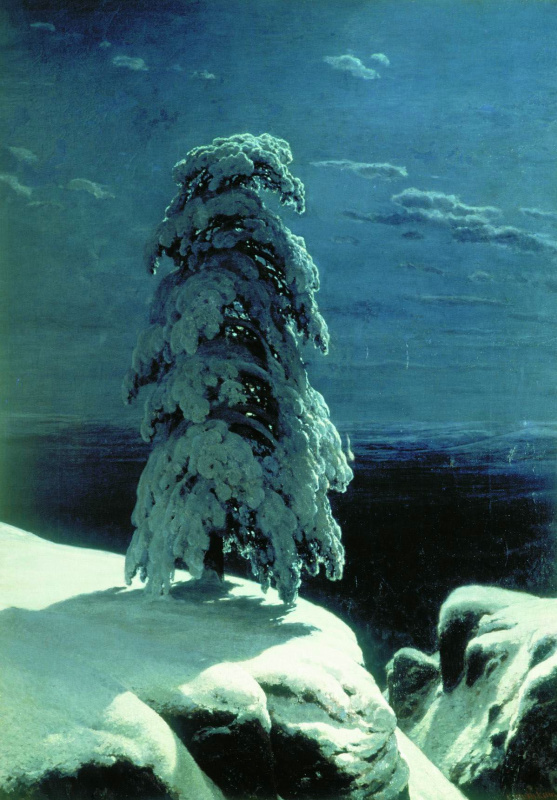 In summer, Ivan Shishkin often visited Valaam, where he selflessly wrote his harsh nature. 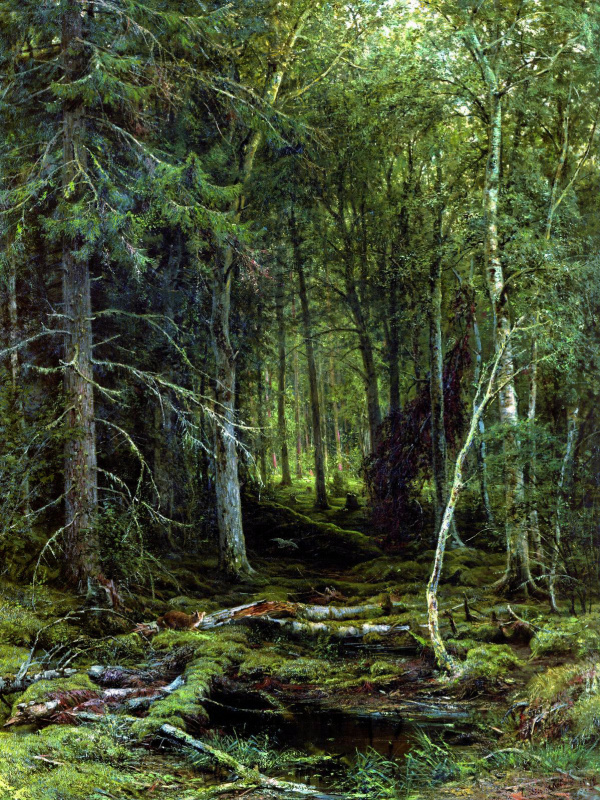 In the open-airs of Valaam, Shishkin’s famous paintings were created, thanks to which they publicly spoke of him as a major original Russian talent. For the picture Shishkin Ivan Ivanovich "View on the island of Valaam. The Kukko Terrain "Academy awarded him the Big Gold Medal and the right to a pensioner’s trip to Europe. 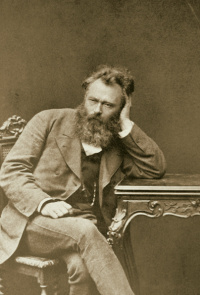 Abroad he lived from 1862 to 1865, mainly in Germany and Switzerland, also visited Belgium, the Czech Republic, France, and Holland. In Düsseldorf, before Shishkin’s paintings became famous, he became famous for his virtuoso drawings, their exhibition was organized in the Dusseldorf Museum. And the work "View in the vicinity of Düsseldorf" brought him the title of academician. Having yearned for home, Shishkin returned to Russia earlier than his retirement period ended. He returned, eagerly undertook to write his native expanses and plunged into the passions that were seething in the artistic environment. Serious, by the way, passions: the famous Riot of 14 under the leadership of Ivan Kramskoy (for more details, see his biography), the refusal of young talented artists to follow the dead laws of academism, the requirement to fill the painting with life, Artel artists, with whom Shishkin became close, and then became one of the founders of the Association of traveling exhibitions. The ideas of the Wanderers, he was faithful to the end of life. 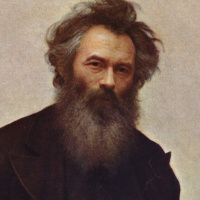 Kramskoy said that Shishkin — "We have the only person who knows nature in a learned way". Indeed, the paintings of the artist Shishkin reproduce the landscape in detail, while showing the viewer much more than the most detailed picture could. 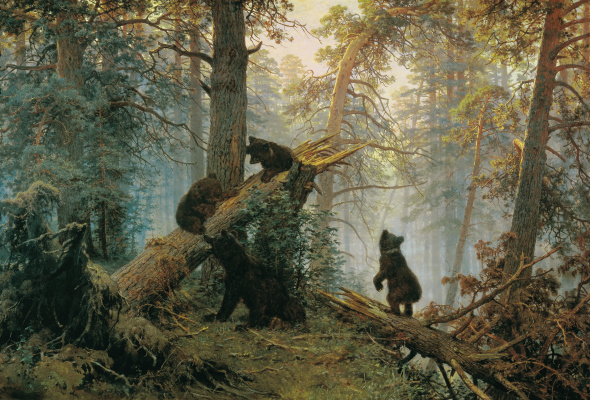 For the painting "Forest Wilderness" in 1873, Shishkin was promoted to professor of landscape painting. 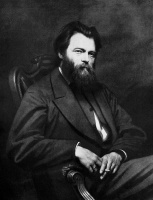 Joys in Shishkin’s personal life were measured out sparingly. His first wife in 1868 was Eugene, sister of the artist Fedor Vasilyev. They lived in perfect harmony, simply and together, often received guests. Often, but not for long. Since 1872, a black stripe has begun in Shishkin’s life, teeming with the deaths of loved ones. His father, whom Shishkin loved very much, died later, then his little son Vladimir. His wife’s brother, Fyodor, with whom Shishkin was a friend, took care of his incurable then fever. And the next year, the disease took Zhenka’s wife, as he called her. A year later, the son of Constantine was not. Shishkin has only his daughter Lydia left — and endless longing. "White light has faded, everything, like in black and white engraving, has lost color. Dear Elabuga back to life "— recalled Shishkin. Landscapes of the land in which he was born, forced to take up the brush. 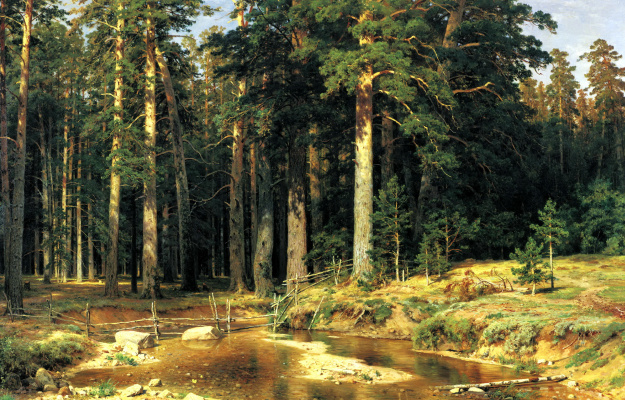 Only with his paintings Ivan Ivanovich Shishkin fled from despair. Olga Ladoga was one of the first thirty women accepted to the Academy of Arts as volunteers. Later, she worked in the workshop Shishkin. 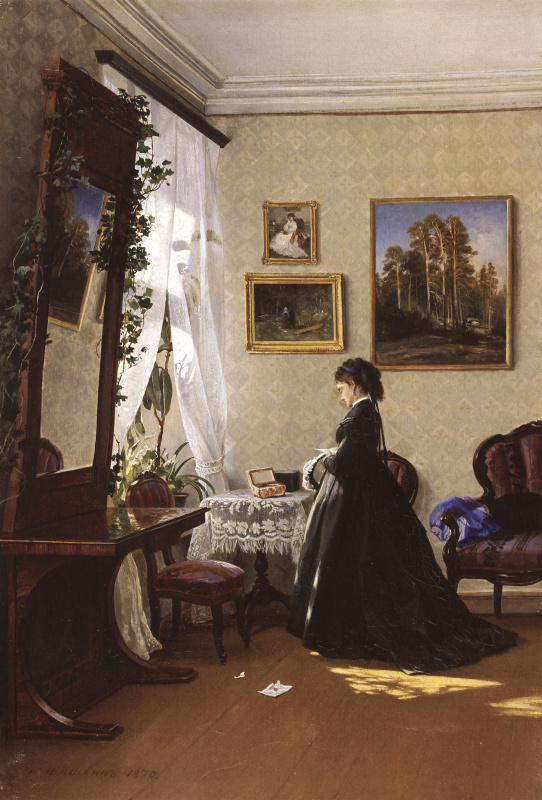 The artist loved his student, and in 1880 she became his wife. Happiness and this time turned out to be short. A year later, Olga gave birth to a daughter, Xenia, and a year later she died of peritoneal inflammation. The girl was taken to her and raised by Olga’s sister. It seems that Shishkin’s muse was jealous. At least, the facts known to biographers say that he no longer tried to devote part of his life to a woman, henceforth Shishkin’s paintings became his only passion. The artist travels a lot on Russian expanses, while traveling created many famous paintings by Shishkin. For two years he headed the landscape workshop at the Academy. In addition to painting, Shishkin made solid advances in the art of engraving, worked in an etching technique using a mixture called "aquamarine", and was a member of the Society of Russian aquaportists. Often one can come across as if avant-garde and as if modern attitude towards Shishkin as an obsolete landscape painter, stuck in his forests and not corresponding to the spirit of the times, and so forth. 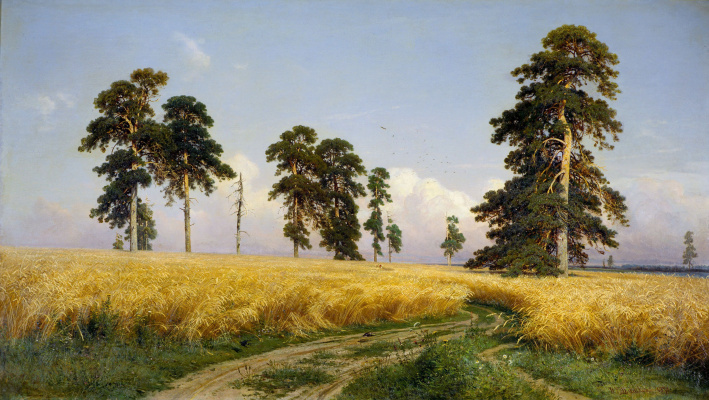 We do not agree with this approach, having eyes will see that, for example, the paintings of Shishkin Ivan Ivanovich of the 1890s are characterized by an increased interest in the light and air environment and not just interest, but its magnificent realization. 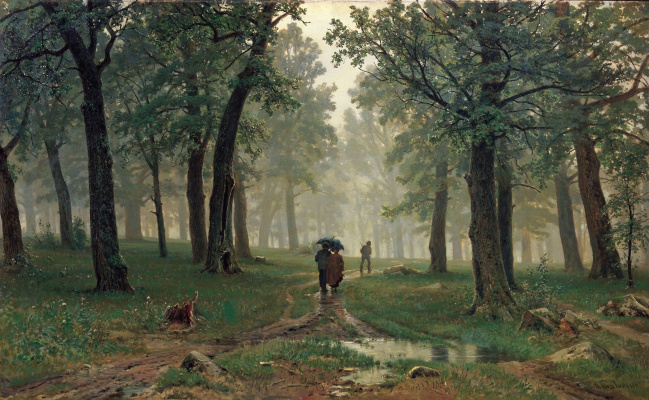 Look at least at the famous picture Shishkin "Rain in the Oak Forest". To depict not just fog, not a state before the rain or after it, but to write the rain itself — while so convincingly … Diminishing rain, a transparent haze in the air, glimpses of solar reflection on the ripples of a large puddle. No, not flirting with the impressionistic current, accuracy and realism are still above all. Before us is much more than a brilliant photo — this is a painting by the artist Shishkin. Do you still think that he is not modern enough? Shishkin perfectly knew how to change, while not changing his principles. See also: a test of knowledge of the artist’s work "Shishkin or not Shishkin?" "In the Northern wilderness ..."